Teresa Carpenter, who has been fostering for 19 years with her husband Peter, received a letter after being nominated by one of her foster children. Nathan, who is now 19, came into Teresa’s care when he was 9 years old and started the nomination two years ago. Teresa sits on KCC’s Corporate Parenting Panel and is also Vice-Chair of Governors for a local school. Over the 19 years, Teresa has looked after 28 children and has been a strong advocate of education to help ensure they can get the best opportunities in life. Teresa has been invited to Buckingham Palace to receive her MBE and she will be celebrating with her family, who she thanks for their support over the years. 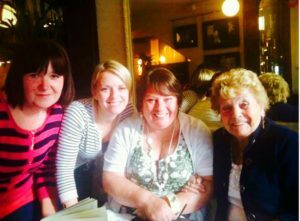 Teresa Carpenter (second from the right) with foster daughter Jo Glen (far left), daughter Leanne Brown (second to left) and mother Barbara Sheerin (right). Roger Gough, KCC Cabinet Member for Children, Young People and Education, said: “Our foster carers do an incredible job and it is extremely heart-warming when they are recognised in this way. “Teresa has opened up her home for almost twenty years and given children an opportunity that may not have been possible without her. We are grateful for her hard work and of course the dedication shown by all our foster carers. Fostering is a paid role and age and experience is not a barrier. Foster carers are fully trained and supported throughout their time fostering with Kent County Council and there are plenty of opportunities to meet with other foster carers. Foster carers can be single, in a long-term relationship, with or without children and do not need to own their own home. They need a spare room and the determination and understanding to make life better for vulnerable children in Kent. To find out more about becoming a foster carer and hear first-hand from foster carers, visit Kent County Council’s next fostering event.